It worked with smoking in the last decade — can social stigmatization persuade people to change their behavior with respect to the environment? April 14, 2009, 11:47 a.m.
After a revolt against plastic bags swept Europe a few years ago with a public response to a popular outcry not seen on the continent since 1848, bans and taxes on these convenient but profligate polluters are now sweeping the US. But as expensive as these taxes can be, new research shows that a few extra cents tacked onto your grocery bill isn’t always as costly as the glares from customers using their own canvas bags. People’s social motivations are usually stronger than their green consciousness and even their economic motivations, according Noah Goldstein, a UCLA professor who has published on the motivations behind environmental behaviors. In a recent study, Goldstein and his team found that a standard environmental message on a sign in a hotel bathroom isn’t usually enough to encourage visitors to reuse towels. But telling customers that other hotel patrons had been hanging their towels on the racks instead of leaving them on the floor made them 25 percent more likely to do the same. According to Bruce Link and Jo Phelan, professors at the Mailman School of Public Health at Columbia University, social stigma exists when four conditions converge: Categories are established to differentiate groups of people such as environmentalists and others who don’t care; some of these categories have certain adverse attributes; an “us” versus “them” separation results; and finally, that labeling causes a loss of status and discrimination. Social norms can also operate against environmental interests. In an experiment Goldstein mentions in his book Yes! Fifty Scientifically Proven Ways to Be Persuasive, Californians were given meters to monitor household energy use. At the end of one month, researchers compiled the results to show households how different households compared. After seeing the results, those with higher-than-average consumption immediately lowered their energy use. But researchers also found that households with the lowest consumption increased their use to correspond more closely to the norm. Goldstein and his partners found a simple way to bring an end to that: A smiley face next to energy savers’ usage. People tend to evaluate their environmental behavior compared to others, said Erich Muehlegger, a Harvard University public policy professor. If the average person’s energy bill is lower than your own and you consider yourself more eco-conscious than the average person, you will lower your consumption. “The belief is that if everyone else is engaging in it, it must be effective and it must by useful,” Goldstein said. Adding a financial incentive complicates the social norm motivation. In a follow-up to the hotel towel experiment, Goldstein added a note to the bathroom signs saying that the hotel would donate a percentage of its savings from towel re-use to an environmental protection organization. An alternate message stated the hotel had already made a contribution on behalf of the guests and requested that customers help cover the costs by reusing their towels. “The hotel was more effective in persuasion if it offered to do things unconditionally rather than having you take the first step,” Goldstein said. That way, reusing towels becomes a partnership toward a greater good. People’s motivations for acting in ways they perceive as helping the environment are myriad and complex. Despite superior mileage, because of the higher cost of hybrid vehicles (even with tax incentives) when gas was under $2 a gallon many hybrid owners would need to drive their cars 100,000 miles — far more than average —to realize any savings. Indeed, Prius owners surveyed in Oregon in 2007 said the main reason they purchased their cars was to make a statement about themselves. And before the energy-use experiments in California, residents ranked their green consciousness as their top reason for conserving energy. But Goldstein’s team found that a more accurate description might have been “everyone else is doing it.” Even though in surveys people denied the influence of other people as a factor in their behavior, the experiments showed that people's energy use was less motivated by intrinsic reasons than the subjects liked to think. In Ireland, there was initially the an economic incentive, and a social judgment later developed. A new tax can initially encourage some people to buy cloth bags, and as other consumers observe this trend, more people are encouraged to buy them, causing a snowball effect. Now San Francisco has instituted a ban on plastic bags, and New York City Mayor Michael Bloomberg has proposed a six-cent tax. But Goldstein says the sneers of peers will be more powerful. “If people believe that strangers or peers disapprove, that would have a bigger impact than saving six cents on your bag,” he said. 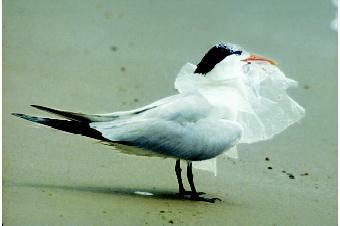 And because plastic bags are so visible, they can easily be stigmatized. Muehlegger, though, theorized that the new tax could become a disincentive for people who already use cloth sacks: Bringing their own bag could demonstrate frugality rather than environmental consciousness, so those people may eschew the cloth alternative, or need to find another way to demonstrate how green they are. Perhaps they could keep the cloth bag and buy an expensive hybrid to drive to the store. But what about those New Yorkers that don’t drive? Story by Sushma Subramanian. This article originally appeared in "Plenty" in November 2008. It worked with smoking in the last decade-can social stigmatization persuade people to change their behavior with respect to the environment?